At the Concierge Desk, these are probably the two most popular questions we receive from our guests. Whether you are joining us for a day or a whole week, a trip along the Freedom Trail in Downtown Boston is one of our favorite activities to recommend! Covering 2.5 miles, the Freedom Trail is marked throughout our city with double-lined red bricks, guiding you to 16 points of interest that contributed to the American Revolution over 200 years ago! 1. 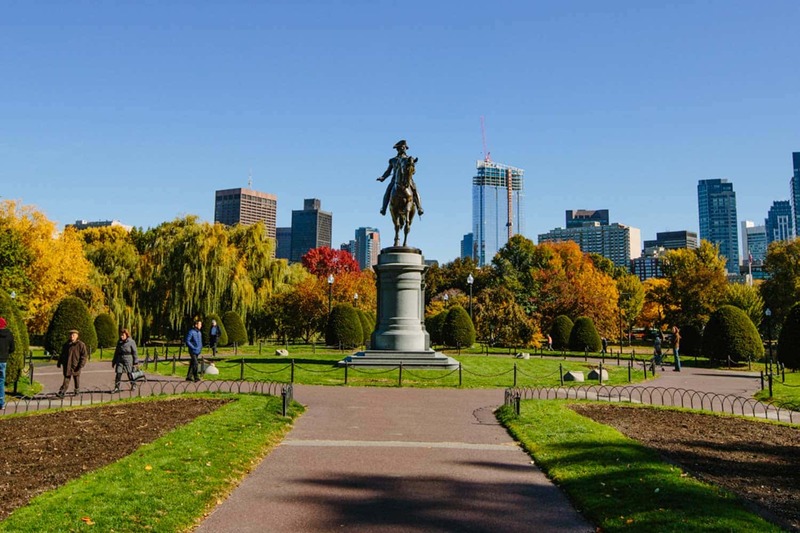 Boston Common and Public Garden – Once you take a right out of our doors onto Boylston Street, you will enjoy a beautiful and scenic walk through the heart of Back Bay. Passing by the famous Swan Boats in the Public Garden, you will head towards the right-hand side of the Common to find the Visitors Center, where guided tours are offered daily by Freedom Trail historians in period clothing! Not only are you walking through America’s oldest public park – but it is also the crown jewel of Boston’s Emerald Necklace! 2. The TWO State Houses – Yes, you read that right! The Massachusetts State House is one building you certainly won’t miss! The majestic gilded dome is perched atop Beacon Hill, one of Boston’s most famous neighborhoods. Fun Fact: During World Word II, the dome was covered with wooden planks, so the State House wouldn’t stick out in the Boston skyline! The Old State House – now transformed into the Blue Line’s State Street T stop – is where you can listen to the Declaration of Independence read to crowds on the balcony every Fourth of July… the same spot where it was first read in 1776! 3. Faneuil Hall and Quincy Market – Once home to Boston’s first public meeting house, Faneuil Hall Marketplace now hosts a variety of shopping and dining options that cannot be missed! It consists of the hall itself, along with Quincy Market’s North & South buildings. Don’t be surprised if you see rallies, street performers, or one-of-a-kind pop up shops! During the winter, BLINK!’s nightly LED spectacular light show spreads the holiday cheer. Plus, on the second Thursday of each month, newly confirmed US citizens are sworn in inside Faneuil Hall itself! This bustling marketplace makes for a great stop in our book! 4. One if by Land, Two if by Sea – You’ve made it to the North End! Go ahead, take a break! There are over a hundred restaurants in this tiny Italian neighborhood, waiting to welcome your hungry stomachs and let you rest your feet! As the only residence located on the Freedom Trail, Paul Revere’s house is tucked away in North Square holding onto its rich history. Don’t forget to stop in & join the revolution with a tour! Once you have made it through the winding cobblestone streets, you’ll soon be looking upon The Old North Church. This church is well known as the spot to where Paul Revere looked for the signal of the British Army coming! 5. Charlestown – If you aren’t tired enough, we have saved the stairs for last! On the site of the Battle of Bunker Hill, the 294-step Bunker Hill Monument was the inspiration for the Leonard P. Zakim Bridge, built as part of Boston’s infamous Big Dig. Here you will also find the Charlestown Navy Yard, home to the USS Constitution – the oldest remaining commissioned warship in the US Navy! Although she is dry-docked until the autumn of 2017 for restoration and repairs, “Old Ironsides” cannot be missed! But that’s not all our lovely city has to offer! Did you find the spot where Boston Cream Pie was invented? What about the lion and the unicorn overlooking State Street? Did you see the golden pieces of trash laid into the sidewalk downtown? The golden grasshopper weathervane atop Faneuil Hall? There are enough activities to keep even the most ardent adventurer occupied for days on end! We can’t wait to welcome you back to the Lenox to hear about what other hidden treasures you found!